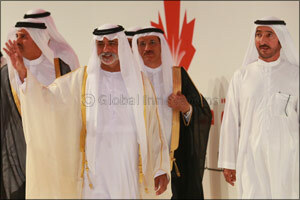 Dubai, UAE, May 1, 2016: His Excellency Sheikh Nahyan Bin Mubarak Al Nahyan, Minister of Culture and Knowledge Development, has presided over the 6th convocation of Canadian University Dubai (CUD) in a ceremony that commemorated the 10th anniversary of the University's establishment in the UAE. Alongside the anniversary celebrations, this year's event had a genuine family feel, as several sets of sibling celebrated their success together. The ceremony also saw The Honorable Jean Charest, 29th Premier of Qu�bec and former Deputy Prime Minister of Canada, receive an honorary doctorate degree. Accepting the award, Mr. Charest said, 'I have dedicated my political life to the idea of Canada and for this reason, I am deeply honored to receive this doctorate from CUD. On the surface, Dubai and Canada seem worlds apart, but they are moving forward in the same direction. University Chancellor, Mr. Buti Saeed Al Ghandi; Vice-Chancellor and President, Dr. Karim Chelli; Canadian Ambassador to the UAE, His Excellency Dr. Arif Lalani; and the CUD Board of Trustees, also presided over the graduation ceremony, which this year saw the award of 466 degrees. Among the siblings graduating in front of a full-house at Sheikh Rashid Hall, Dubai World Trade Centre, were brother and sister Shaikh Abdulaziz Humaid Abdulaziz Al Qassimi and Shaikha Amna Humaid Abdulaziz Humaid Al Qassimi, both being conferred with a Master of Business Administration in General Management. Meanwhile, it was a triple celebration for the Theyab family, with brothers Moath and Saif, and sister Eman all graduating from the same program on the same day. The three Bachelor of Communications graduates followed in the footsteps of their older brother, Kamel, who completed his MBA at CUD. Canadian University Dubai (CUD) was established in 2006 to deliver high-quality undergraduate, graduate, continuing education and corporate training programs in the UAE, and also provide a gateway for students to pursue higher education opportunities in Canada. CUD is located in the heart of Dubai's downtown business district and each of our academic programs is based on Canadian curriculum and education principles. This gives students the opportunity to obtain a Canadian education while experiencing the unique culture and values of the United Arab Emirates. With over 100 different nationalities that call our University home, our diverse student community is building bridges across cultures and continents in one of the world's most dynamic cities.